Normally caused by an interrupted or failed update, or by turning off the Xbox power at the wrong time, the E200 error can seem like a hard one to cure. You may see codes such as E200 00000074 00000000 or E200 000000EF 00000000. You may even get the E200 error message and then the Xbox fail to get past the green loading screen on next boot, or even boot fully but the dashboard runs incredibly slowly. Many people don’t know there’s an easy way to hard reset your Xbox One. Simply hold down the power button on the front of your Xbox for 10 seconds. You can then press to turn back on. This fixes many issues, especially game crashes. You can also try the same but with also unplugging the power cable for at least 10 seconds before turning back on. Use a PC to format a USB drive (at least 4GB) to NTFS file system. Download the Offline System Update file, unzip and put the $SystemUpdate file on your formatted drive. Power on your console while holding the BIND and EJECT buttons for 15 seconds. Listen for two startup chimes. You should see the Troubleshoot screen below. 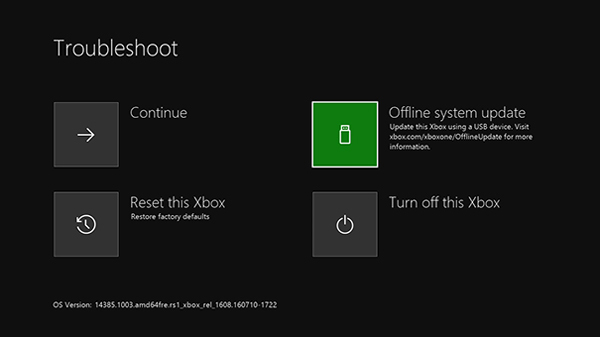 Put the USB drive in your Xbox One and select ‘Offline system update’ from the menu using you controller. The console will then manually update and restart. Occasionally the manual update process won’t fix every Xbox One issue, which means it’s time for the heavy duty approach. From the same Troubleshoot menu as above choose the ‘Reset the Xbox’ option. Here’s the important bit: choose ‘Reset and keep my games and apps’. This will keep all your saved games, downloaded games and many other options. (If you choose the other option you will lose EVERYTHING on your Xbox). On restarting you will need to log in to your Microsoft account again and reinstate any personalisation options such as backgrounds and colours. Very rarely, none of the above will work. At the end of the day, your Xbox One is just a computer – albeit one built for gaming. Its components, namely the hard drive can be repaired or swapped with the right expertise. Firstly check with Microsoft to see if your Xbox One is still under warranty. If not, there’s many companies out there that offer a repair service at a cost, including Microsoft themselves.